Goodness, can you believe it is Friday again? I have a feeling before we know it, it will be time for Christmas shopping and holidays. I recently got my hands on some of the China Glaze Textures polishes. These polishes are textured but with no glitter at all which makes it a bit different than the other textured polishes I have shown you before. Bump & Grind is a dark pink creme textured polish. It is actually brighter than the photo shows but it is also a darker pink. This is two coats with no topcoat (obviously) and it went on really well. It’s also extremely opaque in one coat alone. I left the first coat to dry for a little bit before adding the second coat. Easy application and beautiful colour. A unique texture. What more could one ask for right? I absolutely love this one. Of coarse is a bright blue creme textured polish. It has the same flawless application as Bump & Grind. This is also two coats with no topcoat. I love this blue. It feels very summery and bright. I really enjoyed these textures more than I thought I would. I like that it has no glitter in as it makes it slightly more unique. Of course, I had to add some polka dots. I used Of Coarse to make polka dots over Bump & Grind. This turned out really bright and fun. What do you think? I am sorry for the short and sweet post today. I am so pressed for time. Lately it feels like there are just not enough hours in a day to do everything. Am I the only one? Anyway, let me know what you think of these textured polishes, especially compared to others you have seen. I hope you have a great weekend! I love this! Ugh, I need to get these texture polishes in my life…Oooh, Bump and Grind is on my ChG Wishlist though. 😀 Love this look M! LOVE IT! 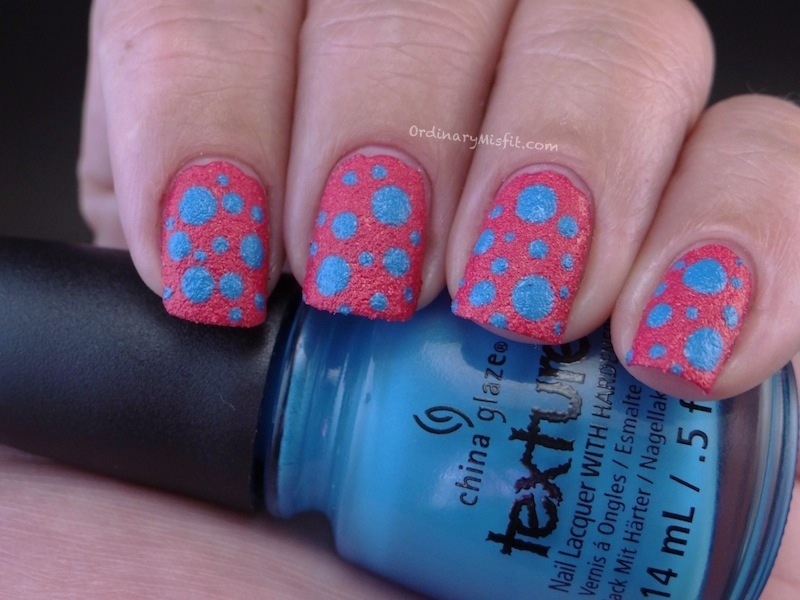 I loooove the china glaze textures… Sometimes I prefer textures without glitter… It adds a special look to it. I absolutely agree Lynette. I think they are so unique and I love that they are not glittered. The texture is actually much more visible as well. I can’t wait to get a few more of these. Mamazombie recently posted…Spam Comment of the Day! Thanks Kerry. I am also still loving the textures. Omg This is absolutely gorgeous! wish I owned a few of these! Brilliant post! Thanks Chanelle. They really are gorgeous! I am new to the nailart scene and absolutely love it! Unfortunately I can only do it over weekends (and now and then on days I am not wearing uniform) since I am in the Defence Force. I would like to know where you got the ChinaGlaze polishes from? I would love to have some! Sorry for the delayed response. So lovely to meet another nail art lover! I got them from a salon locally but you can go to Chinaglaze.co.za to find a stockist near you. You can also find them on FB. Let me know if there is anything else I can help with! I would also love to see your designs so feel free to share them on my FB page. Thank you so much for getting in touch and the kind words!! I have felt crazy busy since about early August, too, blargh! I love this mani! Cannot get over it!! I don’t like bump and grind so much on it’s own but the blue on it’s own is bright, summery and fun! Thanks V!!! The blue is so gorgeous! !